Ford drops to 4th place. Industry sales in the red for the year. But FCA sales jump. GM stopped giving out monthly numbers of new-vehicle deliveries earlier this year, and switched to quarterly releases. Today it reported its third quarter new vehicle deliveries, and they plunged 11% compared to a year ago, to 694,638 cars and light trucks. All of its brands lost ground. Because we stubbornly insist on monthly numbers, even if GM [GM] is hiding them, they’re now being estimated. Based on Bloomberg’s survey of analysts, GM’s sales in the month of September plunged 14%. Automotive News estimated that GM’s September deliveries plunged 15.8% to 235,228 vehicles, with GM Silverado pickup sales down 19% (44,960) and Sierra pickup sales down 35% (11,724). These are hot vehicles – or should have been. These “deliveries” represent the number of new vehicles sold and delivered by dealers to their customers, or delivered by automakers directly to large fleet customers, such as rental car companies. Ford [F] reported that sales in September dropped 11.2% to 197,404 – with deliveries at the Ford brand down 11.3% (189,236) and at the Lincoln brands down 7.2% (8,168). For the first nine months, sales fell 2.4%. Retail sales plunged 12.6% and fleet sales fell 6.7%. Fleet sales (to rental car companies, commercial fleets, and governments) amounted to 24.9% of total sales, compared to 30.5% so far this year. Ford is pulling out of car sales in the US, discontinuing sales of most sedans except for the Mustang, and it shows: Car sales plunged 25.7% to just 37,112 in September and are down 17.4%. At this pace, it won’t take Ford long to be done with car sales. Even truck sales, the hot segment for Ford, plunged 9.9%, with sales of the sacred F-series down 8.8% in September. SUV and crossover sales fell 2.7%. Ford blamed the hurricanes last year and this year. For the industry, September presented a tough scenario for comparison due to strong performance a year ago resulting from pent-up and replacement demand following Hurricane Harvey in Houston, while September 2018 experienced some weather-related impact due to Hurricane Florence. “Tale of two hurricanes” is what Ford’s head of US sales, Mark LaNerve called this phenomenon in a conference call. OK, I get it, the hurricanes were terrible, but apparently didn’t hit Fiat-Chrysler. Fiat Chrysler, whose brands include Chrysler, Dodge, Jeep, Alfa Romeo, Fiat, and Maserati, was able to boost its sales by 14.5% in September to 200,769 new vehicles. It thus outsold Ford and moved into third position behind GM and Toyota. Ford dropped into fourth place. Fleet sales accounted for 25% of total sales. Sales at Ram surged 10%, at Jeep 14%, and at Dodge 41%. Fiat volume plunged 41%, Chrysler volume fell 7%, and Maserati sales dropped 15% to just 950 cars. Maserati sales are down nearly 16% YTD. 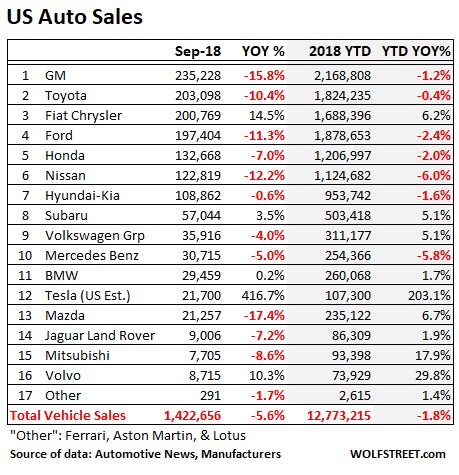 Toyota’s sales, including Lexus and the now abandoned Scion brand, fell 10.4% in September to 203,098, putting the company in second place, just ahead of FCA and Ford. Year-to-date sales inched down 0.4% to 1,824,235. SUV sales fell 1.6% to 77,046 for the month but are up 10% YTD. Pickup sales jumped 15.4% (to 33,710) for the month and 16.6% YTD. Other manufacturers didn’t fare so well either: Among the largest: Nissan’s deliveries plunged 12.2% in September and 6.0% YTD. Honda deliveries dropped 7.0% for the month and 2% YTD. Among the smaller automakers – but the one that hogs all the attention – Tesla was finally able to get some larger numbers of Model 3s delivered. Since it discloses only global deliveries on a quarterly basis, monthly US deliveries are estimated. According to estimates by Automotive News, Tesla delivered 21,700 vehicles in the US in September, up from 4,200 a year ago. This gave Tesla a market share in the US of 1.5%, just ahead of Mazda. So overall it was a lousy month, with total sales down 5.6% from a year ago, dragging year-to-date sales into the red: down 1.8%. This comes after 2017, which had already been a down year. So the hopes that 2018 would produce higher sales for the industry than last year are rapidly being dashed. But consumers, struggling with affordability of new vehicles, are switching to used vehicles. And the used-vehicle market is hot, and prices spike to record levels. Read… What’s Going On in the Used Car & Truck Market? ← The Return of “Beyond Petroleum”: All Talk and No Strategy? What happens when revenues drop 15% year over year, but costs are largely fixed and pensions need funding? Looks like trouble ahead. Check it out above. Tesla market share in the US in Sep rose to 1.5%. It’s now almost visible. GM sales in the US are now only 11 times bigger than Tesla’s. But wait… the US is GM’s second largest market, after China. Tesla sells almost nothing in China. And the bears suggest that these Tesla third quarter numbers represent a total surge stock price pump. I tend to agree considering all the operational and management problems Tesla seems to have. I suspect fourth quarter sales will be much, much lower than this quarter. Tesla’s numbers look misleading? It looks like Tesla’s total production numbers assuming they don’t ship any cars out of the US. InsideEVs estimates September Tesla US sales at 22250 Model 3, 3750 Model S and 3975 Model X, thus in sum almost 30,000. The numbers for the first 9 months from Autonews (107,000) are more in line with InsideEVs (114,000). So I suspect the share and rank of Tesla might be a bit higher. Also, the average sale price of Tesla models is somewhere around 70,000. So if you look at the market share in that perspective, it might rather around 5%, which might be just a tad more than “almost visible”, and, I’d say, an astonishing achievement for a 100% EV company that was totally invisible 6 years ago. Still, your doubts about Tesla’s future have not been refuted yet… 2019 will show. I was just back visiting relatives from MI and it’s all about “the big 3” in terms of employment. So my sisters significant other has worked at zillions of auto plants. He’s installed machinery and wired 4 auto assembly plants so he knows WTF he’s talking about. Well he visited a Tesla plant late last year and his view of the operation is as follows: “they don’t have a clue WTF they are doing”. I have been selling production items to auto assembly plants for nearly 50 years. This comment rings true. Occasionally assembly plants roll cars/trucks off the end of the line to a repair area, but these are crisis situations, which are soon corrected. As the author says the vehicles normally roll off the line and are driven to designated places for pickup by the carriers. Tesla final assembly is poorly managed, and I would not buy one for that reason even if it were “only” $35,000.00. Comparably priced cars are far better made than a Tesla. From my experience with GM, they appear to still have the same issues, but its called warranty work and handled by their dealers. I have owned Ford stock for the past 4 years and I am finally calling it quits. I’m 52 and have been trading stocks since I was 10. I get that Ford and GM are old companies with legacy costs, but I used to assume that profits mattered. In today’s world, all the WS buyers want is a tie to the internet and profits are bad. Look at SFIX today. They are one of the few recent IPO’s that make money and they got hammered because of 25% revenue increases. I’m putting my cash in Marcus at 1.90% and will watch from the sidelines. Slightly off-topic. Five friends of mine here in the Bay Area told me that they are leasing new cars for two to five years with a buy-in option at the end of the lease. They swear that they did the numbers on Excel and the numbers came out better than buying a new car. All of them leased-bought cars > $40k. I’ve never considered this option so I have no idea if the trouble is worth it. A five people sample is so small that doesn’t even qualify as anecdotal but I’m surprised that I started to hear about it more often after 2017. The option of buying the car at the end of the lease is pretty common. Whether it is worthwhile to do so depends on various factors. Sometimes it might make sense but often it doesn’t. If you leased because it is the cheapest option and your financial situation did not improve by the end of the lease, buying that car may be your only option, especially if your credit has suffered. You can make the numbers say anything if you really want something. Can you lease a vehicle and having lower payments than buying? Yes, when I moved back to the US with my wife, we needed 2 cars for work but couldn’t afford 2 car payments. We leased 2 cars and when we were more financially stable, we bought. She leased a Hyundai Elantra for $238 a month with $0 for 3 years, 1st payment free so 35 months, and I was able to work a better deal for me a few months later with more experience of $208 per month for 3 years, first payment free for a Honda Civic. With a lease, you’re always going to be paying unless you buy the leased vehicle or decide to buy something else, which is nearly always a bad deal. Now, there are sometimes lease specials where you can lease cars very very cheaply, like $100 a month or less cheap, but it requires a lot of research and patients and working of deals. Higher used car values due to demand will lift residual buy out price. Auto makers would have to keep monthly payments low due to lower depreciation and I bet they raise them also. I leased a Miata for one year and then bought it back in 1997, because it was cheaper than buying it outright. I still have a hard time believing it but the numbers didn’t lie. Just wondering if some daring, adventurous manufacturer would consider trotting out a basic passenger car devoid of computers. You know, the kind of car people once fell in love with, worked on themselves, could afford to have repaired when something went wrong that they couldn’t fix themselves. If America’s love affair with the automobile is over, it is because the lover was spurned. People can work on cars themselves. Vehicle computers aren’t really an obstacle, most are reverse engineered and hacked quickly. When I had to replace the ignition mechanism on my old Honda Accord, it requires a dealer to reprogram the keys and the lock mechanism that reads the keys. Did it in my friend’s driveway who has never worked for an auto anything. It’s all out there. Don’t fear it. There are tons of tutorials on YouTube on how to work on cars. It’s a good reason to get a vehicle that has a large user base, because it makes parts easy to get and knowledge on how to fix the thing easy to find. Thank you for that, JoAnn. Many of us don’t want a vehicle that doubles as a family entertainment/telecom center/internet hub/hacker target. We just want to get to where we’re going at a reasonable cost and a minimum of drama. Not to mention it is a ubiquitous tracking device of time, distances, speed, and destinations travelled. Separately the police are now tracking license plates. I assume Tesla knows exactly where you stop to charge your car. Goodbye privacy! And (to take just one scenario) imagine trying to have a discrete affair or something like that (god forbid!). In divorce court the spouse could request all one’s travel log information. In the UK the Tube travel is logged. Uber and Lyft know where you’ve been. 90% of those wonderful old film noirs couldn’t be made! Sign me up. It’s the main reason why I still drive an ’86 Toyota PU. I redid the body this past year and it looks brand new. From purchase cost, maint, and two body rebuilds I have $10,000 in the truck…total. I need some exhaust work and a few years ago I fabbed up and welded in some frame gussets (rust). Modifying the frame is illegal but I have gone through a few roadside RCMP stops and they overlook it every time. The truck body looks so nice they just think everything else is okay. I plan to replace it one day with a new truck but can’t bring myself to do it. 10 years ago I used it to haul 3500 lbs of flooring. I had 1500 lbs in the back and towed a trailer with another 2,000 lbs + trailer weight. It was pretty scary and I couldn’t go over 60km/hr or it would start weaving. Now, how could I walk away from this old workhorse? 2.34litre r22 engine….awesome. Not true. The safety devices are where the costs lie. I’m with you. I just want a simple, easy to maintain vehicle to get me around. I’m in the Keep It Simple Stupid camp and don’t care that you can order a pizza through the dashboard of modern cars. To me all the electronics are a maintenance nightmare and the electronic displays in the interior are a distraction from keeping your eyes on the road. It baffles me to see cars with a 10yr+ projected useful life being equipped with fancy electronics (built-in GPS, on-board entertainment, communications) that are certain to be obsolete within 3 years. So what are you going to do after these 3 years? The standard GPS will no longer be supported with new roadmaps so you have to put a new unit next to it on the dash, the music player will no longer accept the newest file formats, and over-the-air updates will no longer arrive. Not to speak of all the electrical gremlins showing up in ageing wiring and the absurd cost of having these problems repaired by the dealer… if they are able to do so at all! I consider car electronics a curse that causes cars to become obsolete long before the hardware is worn out. The end of cheap/easy money and rising interest rates is going to pop quite a few bubbles. I see margin calls from east moving west affecting property values…. Yeah, because electricity is free……..Tesla is an accident waiting to happen. It’s not exactly an apples-to-apples comparison becuase Tesla is selling product that’s essentially been back-ordered for years and thus has had an enormous span of time to accumulate orders. The “fossils” sell cars on demand. If Tesla ever gets to that state then it might be a more fair comparison. Don’t hold your breath. You are already required to increase the subsidies you pay to the fossil fuel industry, recently amounting to 6.5% of global GDP or $5 trillion per year and rising. You will not be notified and your permission is not needed. Federal policy. Sorry. The fossil fuel industry has been buying up politicians since the 19th century, at least since Arrhenius figured out that greenhouse gases could make climate change an existential problem. In the interim the situation has steadily degenerated and cannot be reversed in time to prevent the worst. In my view as a mechanical engineer, the energy usage in general is too high for a sustainable electric car transportation infrastructure. People are already complaining about the wide spread use of wind in Germany. Renewables are just reaching 20% of demand too. Ho will louder will they complain when the % goes up? A rough napkin calculation says that electricity demand will increase about 30% if a petroleum based car is replace by an electric car. I’m starting to see a lot of those Saturn-based Tesla Model 3’s in Seattle, so I’m not surprised at the high growth rate. But man are they ugly. I’d have a hard time paying $30k for the Saturn look-a-like, yet they are selling for $60k. I do believe Tesla is quickly approaching saturation point for the Saturn-based Model 3. The ratings in Consumer Reports suggest there are much stronger buys out there. The quality and repair issues surrounding Tesla are not good for the brand. If they continue making 5000 per week, their unsold inventories will be rising soon. Musk has been operating an automotive manufacturing concern, always fraught with risks even for the best of them, but now has the additional challenge of turning around a failing enterprise, and does not seem inclined, or even able, to give Tesla the kind of attention and expertise it must require to eventually succeed. Hence the popularity of Tesla stock shorts. The fad may be electric cars but the internal combustion engine (ICE) has been reworked, because today a 4 cylinder engine is more efficient and powerful than the old 6 cylinder engines. With direct cylinder injection, 4 to 6 valves per cyclinder instead of the old two, turbo-charging, multi-valve timing, combustion ratio variation, and even supercharging, the ICE has eliminated the old inefficiencies on mpg and power. I believe it will be years until the electric cars can overtake the ICE with the new tech in the ICE. Tesla’s model S 0-60 in 2.8 seconds is behind Porsche 911GT2 at 2.7 seconds. And that Porsche engine will last beyond that electric engine. But many facets besides engine power translate to speed like the transmission and the rear end gear ratios and one cannot forget the suspension setup. Todays big V-8’s can have over 700 hp with 500 lb-ft of torque via being normal aspirated or with a supercharger. I know what a supercharger can do as I put one in a 1964 VW Bug which had governor on the transmission limiting you to a max of 72mph. Without the supercharger you had to be going down big hill to hit 72mph, but with the supercharger you could do 72 anytime you wanted. Now I drive a 2015 Honda Accord 4 cylinder non turbo charged which can overtake all 4 cylinders of most cars, and it gets 40 mpg on the interstate and 30 mpg around town. Nobody builds a better small engine than Honda. I know I still have a 1987 Honda mower than runs fine and I live in Florida where you mow and mow. If you think you can go 7500 miles between oil changes and keep that engine clean think again because even with these new synthetic oils, the engine fails, not because of oil breakdown, but because of carbon deposits caused by every combustion. Changing oil every 5000 miles is the max unless most if your driving is on the interstate. I also use 6 months which ever comes first. Changing oil will prolong the life of engines and it is the cheapest in the long run unless your leasing, then let the next owner have the problems with all the computer sensors being lined with deposits making them ineffective or less sensitive. Remember the Fram commercial, pay me now or pay me later. Ecoboost was always a gimmick. Ford trucks with Ecoboost, for example, are less fuel efficient than their trucks were 20 years ago. Laughing Eagle is correct that ICE have come a long way, and will continue to improve. But some companies do it better than others. (Read: Not Ford). Great post. 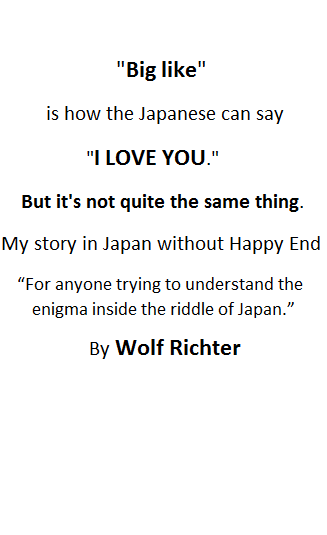 You said it much better than I ever could. Everyone on here knows I’m a huge ICE fan. Electric vehicles were soundly beaten over 100 years ago for a reason. And ICE can significantly improve in the future. One interesting path is using electronic valves (I think NASA derived tech) that are being perfected by Sturman Industries in Colorado. These eliminate camshafts, allow fuel and air injection not possible with conventional ICEs that can significantly increase useful power per unit of fuel and can much better control combustion to reduce pollution emissions. So . . . . people are increasingly unwilling to blow $50k+ for a $20k pickup truck? When you can buy a 3 ton commercial diesel truck for the same price as (or less than) a F150/C1500, something is off. This article is about the US market. GM makes and sells more cars in China than America. Even though it has to split its profits with a partner company and share intellectual properties, they consistently take home more profits to the States than they make in America. This helps prop up the faltering US business. They have been in China for 21 years. 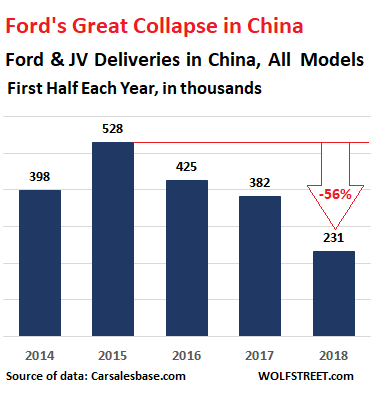 Ford has not been there so long, and they have a reputation for not cooperating very well with the Chinese partner company. This has reduced profits. However, word is that they recently saw the handwriting on the wall and are getting with the program. China is the place to be if you make cars, if you want to make a profit. America is too expensive a place for manufacturing any more. The auto workers in China make $5.75 US an hour, but it buys them a lifestyle similar to what a Detroit autoworker made back in the heyday. A few months ago, Kentucky Toyota workers were making noises about higher pay. The company pointed out to them that they can make cars in Japan and ship them to Kentucky cheaper than they can make them there. The whining stopped. I have been trying to see why. My son-in-law bought a Ford Focus. It has proven to be a good car. It is a very popular vehicle, but some say lagging sales are because they are overdue for a facelift. There are too many choices in China. Every week I see another car logo I have never seen before and I have to look it up. So Toyota and FCA ate into GM and Ford truck sales. Everyone’s sedan numbers are tanking except Dodge, it seems. Maybe it’s because a RWD 4-door is what the market wants? Note that Hyunda-Kia managed to stanch the earlier bleeding. Also note they’re the only ones happy to play in the affordable segment. What are the chances we’re seeing a very large shift in the core markets? If the labor market is tight and millennials are finally buying cars because they have jobs, what are the chances they’re focusing on expensive trucks and SUV’s, considering they pay up to half their income on rent and another 10% on lifetime student loan payment plans? I read somewhere that with ICE vehicles the most expensive component (the engine) is manufactured in-house, but with EV’s they are the batteries and motors, which are manufactured at Panasonic, etc, thereby killing the profit-margin for automakers. Like the T-Rex eyeing the mammal, or the petroleum industry eying electricity, ICE automakers are in an apex-predator position looking to a future where the ecosystem no longer supports their bloated dietary requirements. You put your finger on a huge structural problem in the EV market: automakers don’t even control the technology that goes into batteries (the battery cells). An ICE might be manufactured by a group of component makers, but automakers control the technology. With a battery, they can design the system that controls it, but the most expensive part is someone else’s technology. No auto maker has been able to solve this issue. Wolf, I’ll submit to you that this issue has been solved, albeit via a back door: plug-in hybrids. 2. Ongoing (for foreseeable future) lithium supply constraints. Note that the Honda Clarity plug-in *actually* sells for mid-30s unlike Tesla’s Model 3. It also offers Honda’s sterling reputation for quality, resale, battery longevity, and its weirdly conservative cache. Even with the ICE, the Clarity weighs the same as the Model 3, and likely does as good or better in crash tests. Plug-ins also offer something new: real-time fuel source shopping. If electric rates spike too high relative to gasoline, drivers could just stop plugging in. Granted, they’d have to spike exponentially. But, even so, a car can be programmed to query the grid and only buy power when it’s available at a rate the driver finds acceptable. There’s a spike in wind production at dusk? Send a signal to all the plugged-in cars, and they start buying. Finally, plug-ins solve for infrastructure. Typical RT commutes rarely exceed 20 miles. Even in spread-eagle Dallas, it’s just under 25 miles. (source: https://www.marketwatch.com/story/here-are-the-typical-commutes-for-every-big-metro-area-2015-03-25). In this scenario, a 120-volt outlet is sufficient. Everyone who lives in a house has one of those. Employers wishing to draw far-flung commuters can now install cheap 120-volt outlets on 10-15% of their parking spots. This allows a plug-in owner to commute up to 50 miles one-way using very little, if any, gasoline. Plug-in owners don’t need — but more importantly, don’t want — a supercharger station every 100 or so miles along every road they travel. For the few long-distance trips taken each month, gasoline is fine. I predict plug-ins will hit their stride in popularity once drivers realize that ICE reliability goes through the roof in a plug-in. Not only is it off most of the time, but when it’s on, it operates in a narrower RPM band. Components can be made more cheaply and more reliably when designers can be sure the ICE will never be asked to operate at the extremes necessary to please lead-footed American drivers. Nah, the car companies just have to gin up the PR campaigns that tells the evils of EV. All those batteries are destined to be e-waste that end up in 3rd world countries, so that the renewable NIMBYs can exploit the poor and the helpless elsewhere. And then the same car companies can support journalism by flying the said reporters and filmmakers over to Africa or Southeast Asia where all of the garbage ends up, and in no time flat, we’ll have the Oscar award winner: The Inconvenient Truth Part 3: the evils of our renewable society. Driving around in Europe, with smog filled cities – and visiting congested Asian cities – you get a real good sense why EVs will likely be pushed on the masses. Forget batteries/lithium/Tesla issues – this is about forcing a ‘cleaner’ end product on the masses – and Americans stabbed in the way big time. My 2007 Chevy Cobalt is humming along and I get blitzed with mailers from Chevy dealers offering me their deal: trade in my car for $1000 over blue book for a new car. My car is paid off, I’ve had great luck with Chevys lasting 15+ years so I plan on holding onto this one for quite awhile. Ditto. My local Nissan dealer really wants my 2012 Altima. They send me junk mail every month telling me just how badly they need my car. Apparently people are walking into their showroom every day asking for 2012 Altimas, and they don’t have any! Who knew? The reality is they wouldn’t even keep a 2012 on the lot. It would go straight to auction. Tiered rates going up shrink buyer pools, high DTI and PTI with higher rates mean cars kept longer. They have sold 100 million cars over last 5 years. It was due…. While I understand there isn’t much political will to increase gas taxes and use the money in support public transportation, or build sustainable communities centered around public mass transit; The 100 year trend of private car ownership on stagnant wages, apparently isn’t sustainable. So, I suppose it’s no small wonder millennials are flocking to city centers and using public transportation. This. Tooling around in almost any car, even a Smart Car, and then paying to go to a gym makes no sense compared with riding a bike with panniers for groceries. The US has been designed as much as possible to make a car a “necessary good” but peope are starting to see through it. Yeah, alex, this stuff makes you wonder. People drive back and forth to work, then drive around the corner to go to the shop, and then drive down the road to go to the gym, where they engage in an equivalent amount of physical activity on a treadmill as walking to all those places would have entailed. Urban sprawl has grown outward and not upward. In doing so it made driving or public transit the only option for a lot of people. Stop trying to preach about how amazing walking everywhere is, people had that option for 1000’s of years and still opted for horses instead. Hi prairies. Sorry if I caused offense, that was not my intention. I just observed on stuff I see in my own surroundings that makes my head start to wonder about how we’ve been programmed to use one form of transport under certain circumstances and use our legs under other circumstances. especially when the activities could easily be combined at a lower cost. Regarding urban sprawl, you are surely correct, but as the oil age is ending I cannot help but wonder how that is going to work out in any other way than as a nasty scenario. But that’s another topic! I would also add that, where I live at least, horses appear not to have broadly been used for human transportation in the past. Old tax records I looked at (not as an expert, I must add, just in the context of a museum!) from small holdings or leaseholds from two or three centuries ago seem to indicate that few small farms here even had horses. They seem to have used or borrowed oxen or work horses for working the fields and for transporting their produce to market. So outside of the towns and larger farming properties few horses seem to have been employed for riding. There is nothing stopping you from personally paying more taxes and you should feel free to do so. Ahh, but you want others to pay more taxes. Also, you are free to take a bus to work, walk to the grocery store, take your kids to the beach with an Uber, or take your girlfriend on a date on the back of your bike. All of these actvities would contribute to the “sustainable” world you seek. My point is you have all these freedoms, we also have freedoms; change yourself before you want us to change. I saw a New 2019 Chevy Silverado with side steps fancy wheels while at Home Depot the other day . I said to hubs. I bet it cost 70k . Curious I looked at the price sticker still on the window. 66k. So with tax and license. Yep 70k plus. That is just batchit. Probably a 8 yr note. That’s some debt load . I love my 2000 tundra. Wolf, I thought carmageddon only happened in LA, or I suppose the bay area if they closed down 101 for a weekend. I don’t think we’ll need to worry much about car sales, it’ll eventually level back up… after a much more massive drop than it has already seen currently of course. And besides, too much doom and gloom, with NAFTA 2.0 in place, the North America trade block with do just fine with cars. Might not be so great for the plebians, but seriously, just let them eat cake. As long as we get our cheap stuff, it won’t matter, even though in the end, we’re probably the suckers who has to pay the costs since we’re really the plebs. Wolf, you might do an article about the big tax write off still available to businesses for larger vehicles. I believe it is a major factor in many of these expensive/large pickup sales. The small business owner is able to justify the splurge with the favorable tax treatment. With construction having boomed for a number of years now, this has to have been a factor in large pickup sales. What I don’t understand is Tesla hired the best fo the best but why couldn’t it implement a quality production system? Where does all that investor capital go? Tour a modern car making plant and take notes; it isn’t nuclear fusion engineering. “best of the best”??? Isn’t that the motto P45 used? I thought Tesla was all about- automate, automate, automate. Let the machines do it all, no workers rights to worry about. One thing I have wondered: Since Ford isn’t making cars anymore, what will police officers drive? Many today are driving the Taurus. Did Ford decide the contract isn’t worth it? Will police depts switch to Chargers, or Impalas exclusively? Or will we see more SUV cars, such as the Explorer? I see lots of cop cars that are crossovers (compact SUVs). The Explorer Police Interceptor will replace the Taurus. They still sell both currently. The Ford Exployer will never compete with a Dodge Charger which is what the Florida State police use now. Why? Because anyone who has raced cars wants rear wheel drive vehicles because of better control. Front wheel drive creates torque steer, affecting your steering, and with rapid acceleration and quick stops you do not need torque steer to mess with your steering of a car. Past years, the state police used Ford Crown Victorias again because they were rear wheel drive. But Ford in their wisdom cancelled its production. And rear wheel drive also requires less maintenance than that front drive. Front drive is for snow but not for rainy or dry conditions. If you want a fast controllable car the chassy is the key and front wheel drive is not the best chassy to have. It is not just about engine HP, but can the chassy deliver all that HP to the road. The Ford Police Interceptor Utility (Explorer) is now the top selling police vehicle in this country. But FYI they’re coming out with a new Explorer for 2020 that will be RWD. And it was just tested as the fastest police vehicle. My city’s police department is all Chevy. Full size SUV, Sedans, and muscle cars on the freeway. Do you think this is the real reason Ford is phasing out cars? There is a standard of fuel efficiency by size of the vehicle. Seems a bit silly of a regulation to me, but explains why so many cars are so large now. FCA’s doing well. Their strategy of focusing on trucks, SUVs, crossovers and large muscle cars seems to be working. They do have a few small Fiat models, but sell very few of them. Ford has recently announced they’ll be dropping most car models as well. So it’ll be interesting to see if that works for them, too. Mark D. Fastest car is not always the best car. A sedan will handle better than any SUV because of lower center of gravity and its height will affect the drag (the air flow over the shape of the vehicle). Imagine NASCAR racing SUVs, they have enough problems with their trucks doing 200 mph plus like their sedans at the super speedways like Talledaga. The article you linked, in my opinion, is hype by Ford. The testing was done by the Michigan State Police. There are lots of other articles out there about it, if you just Google it.